The RAF is to halt bombing on one of its ranges to allow a landscape of ancient peat bogs to be restored. The Border Mires in the north east of England were formed as the last Ice Age ended - about 10,000 years ago. 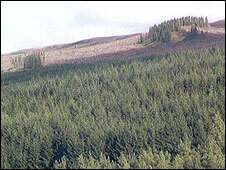 After World War II, Spadeadam Forest - on the border with Northumberland and Cumbria - was planted, and is used as a "warfare tactics facility". Low-level bombing exercises will now be suspended as up to 145,000 trees are cut down over 10 weeks. The forest was planted to build up the nation's timber reserves after the war, and ancient boggy areas were lost. It is hoped that the Forestry Commission scheme will boost vegetation like bog asphodel, sphagnum mosses and sundews. Ecologist Tom Dearnley said: "The work is an important milestone in a long-term project to restore this amazing habitat. "The Border Mires are not only one of the UK's most important wetland habitats, but they are of global significance. "The work will enable bog plants to keep their roots in the water and allow the surrounding forest to continue growing on more solid ground." According to the RAF, its Spadeadam base is the only one in Europe where aircrews can practise "manoeuvres and tactics against a variety of threats and targets that they face in contemporary warfare". It is used by aircraft from the RAF, Army, Navy and NATO Forces, and crews flying in Iraq and Afghanistan have trained there before seeing active service.